You find yourself starving for something healthy and satisfying, but you’re also time-starved and have about 15 minutes before you need to run out the door again. It’s a dilemma often sated by grabbing a handful of pretzels and some cookies. You want to eat well, but who has time for cooking from scratch? New Year’s resolutions for healthy eating start to go by the wayside as schedules cut into cooking time. Unless, of course, you learn some microwave magic. Microwave oven cooking can really be a busy person’s secret weapon. You might be surprised by what you can make in an over-the-range microwave. Forget the frozen meals. You can make good meals out of fresh ingredients all in your microwave...plus dessert! The editorial staff at AHS Home Matters has compiled some of our very favorite microwave recipes here, to give you easy access. Bookmark the page or save them in your file for the next time you are short on time but longing for healthy and delicious. Quiche isn’t just for brunch and baby showers anymore. Whip up this delightful quiche loaded with fresh veggies in a mug for a quick, portable breakfast. A gluten-free breakfast that combines oats, flax meal, and applesauce with fiber-rich buckwheat for a yummy fast morning meal. A muffin made with fresh berries and coconut oil to satisfy a vegan diet, which is becoming more and more mainstream because of celebrity vegans like Ellen DeGeneres, Bill Clinton and Alicia Silverstone. A great, healthy lunch served up in five minutes? 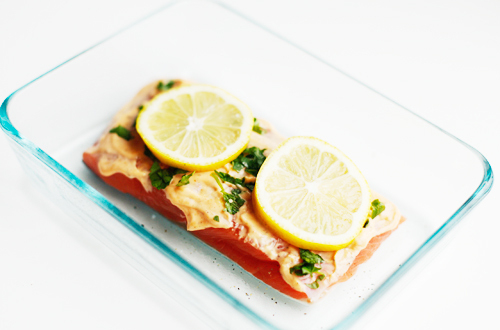 You won’t believe how easy it is to cook tender, flaky salmon in the microwave. Top it with a sriracha mayonnaise sauce for a little heat and your meal is complete. Pile on the black beans, salsa and veggies for a big Tex-Mex taste in a small amount of time. Risotto is known for being a difficult dish that requires timing and a lot of stirring. But this microwave recipe makes it easy to serve up as a savory side dish any night of the week. Add some flair by blending in sautéed mushrooms and spinach, or get creative with your own vegetable additions. Known as piele in Hawaii, this delicious side dish is made with just three simple ingredients: sweet potatoes, coconut milk and fresh ginger. It’s easy! A single serving of chocolate chip, gluten-free deliciousness in less than 5 minutes. Sounds decadent but it’s made with applesauce so it’s not too bad. Plus, it’s just a mugful not a whole cake, so you won’t be tempted for seconds. All the sweetness and none of the guilt! You can whip this up in about five minutes and have a perfectly portion-controlled and perfectly delicious dessert. It’s a fruit so it’s good for you, right? Here’s a fast and easy way to elevate your strawberries to dessert status.